I’ll admit it– I love Marie Kondo. Her Netflix show “Tidying Up with Marie Kondo” has become my go-to when I just need to watch something positive at the end of a long day. I love her cheerful energy, her non-judgmental approach to messy houses (and lives), and the practical usefulness of her advice. But most of all, I love that the whole KonMari phenomenon has shone a bright, tidy spotlight on the art of translation. First of all, “Tidying Up with Marie Kondo” features something very unusual: An interpreter who the producers choose not to edit out of the picture. Marie Iida, who has been interpreting for Kondo for three years, is the voice that English-speaking viewers will come to associate with Kondo’s quirky pronouncements. While never stealing the spotlight from the star of the show, Iida’s seamless consecutive interpretation amplifies and extends Kondo’s bubbly charm and thoughtful approach to sensitive topics. 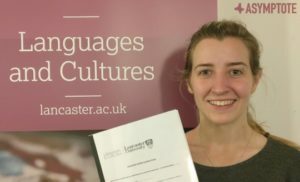 Interpreters’ disembodied voices often appear in documentaries, but it’s rare to have one featured so prominently and consistently in multiple episodes of a wildly popular series, always with her trusty interpreter’s notebook in hand. If you’re interested in learning more about Iida, I recommend checking out this lovely interview with her. I was so pleased by this little bit of representation for linguists that I’ve decided to forgive Netflix’s decision to refer to her as Kondo’s “translator”, when in fact she’s engaged in the very different and extremely challenging art of interpreting. 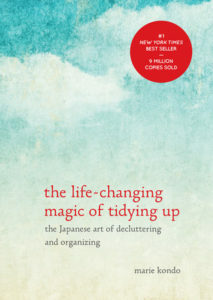 Of course, Marie Kondo’s books (The Life-Changing Magic of Tidying Up and Spark Joy) were translated into English by someone, or perhaps a group of people (I was unable to find the name or names of the translators, please leave them in the comments if you know them!). 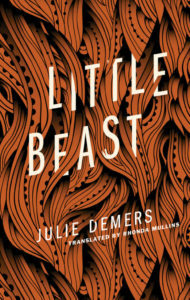 Released in the US in 2014, some saw their blockbuster success as a sign of things to come for translated book (see this article from Publishing Perspectives, and this one from Publisher’s Weekly, for example). Of course, self-help (or pop philosophy, however you prefer to describe the KonMari phenomenon), is a different beast from translated literature. For one thing, readers who would never dream of writing critical articles on literary diction are prone to picking apart the translator’s word choices in non-fiction texts, often without seeming to realize that’s what they’re doing. Case in point: the significant backlash among bibliophiles to Kondo’s suggestion that they should thin out their book collection, keeping only those titles which “spark joy”. This Guardian op-ed captures the thrust of one side of the argument: basically, that “joy” is too simplistic a metric by which to measure the value we get from having books in our lives. The problem with this argument, as many others have pointed out, is that Kondo never actually said our belongings should spark joy. The feeling she insists we learn to cultivate is “ときめき”, pronounced “tokimeki”. The literal translation of this word would be “throbbing” or “palpitation”, a feeling of fluttering or excitement. 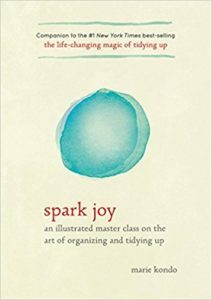 “Spark joy” is a brilliant, creative translation, which conveys many of the connotations of the original phrase while having the punchy, concise quality necessary to make it the foundation of a self-help empire. We could just as easily, however, be debating the relative merits of assessing whether our possessions “give us butterflies”, “make our hearts race”, “cause palpitations” or “are ‘heartthrobs’”. The translator could have decided that beloved objects “inspire”, “arouse”, “create”, “excite” or “plant” joy, instead of “sparking” it. None of the above phrases are nearly as catchy and clear as the final choice of “spark joy”, but all of them capture slightly different elements of the original Japanese. Every translator knows that when you make a word choice, you are sacrificing many other potential collections of implicit meaning. Spend thirty seconds with a thesaurus entry for “joy” and you will get a feel for the incredible amount of thought and craft which went into the phrase “spark joy”, whether or not you like the final result. Some argue that the intense (negative) focus on the word “joy” has racist overtones, and I have sadly seen plenty of reactions which definitely rely on gross stereotypes about Japanese people and East Asia as they scoff at Kondo’s approach. As a secondary offense, I would add that people like the author of the “pro-book” op-ed above are guilty of erasing the significant contribution of translation to the KonMari phenomenon. Don’t like all this talk about “joy”? Your first instinct should be to do some research and find out what might have been lost, gained or simplified in translation. As someone who does not speak or read Japanese, I will have to take others at their word when they explain what tokimeki means or how Shinto traditions have shaped Kondo’s methods. And whether or not I ever end up finally KonMari-ing my kitchen drawers, I know that watching the interpreter Marie Iida at work and spending hours googling “tokimeki” have “sparked joy” for me! I have never been much of a sports fan, but since I moved to England I’ve started to understand the appeal of football, at least when things are going well for “our” team at the World Cup! When Asymptote Journal put out a call for reviews of great writing about the sport, I couldn’t resist the chance to contribute a plug for David Peace. “Born in 1967 in West Yorkshire, England, David Peace is the author of The Damned Utd (2006) and Red or Dead (2013), a pair of strikingly poetic novels about British football in the 1960’s and 70’s. The Damned Utd follows the tale of Brian Clough’s ill-fated time as manager of Leeds United, while Red or Dead details the epic career of Bill Shankly, beloved Liverpool manager from 1959-1974. Peace’s writing has more in common with the patter of a radio announcer during a match than the usual staid paragraphs of sports biographies. This intense, immersive stream-of-consciousness often verges on poetry, and will satisfy even the most football-phobic connoisseur of experimental prose. Discover more great football writers from Austria, Poland, Italy, Norway, Hungary, Brazil, Uruguay and Peru at Asymptote Journal.